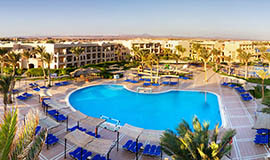 Madinat Coraya is located about 65 km from Marsa Alam City and just 5 km from Marsa Alam International Airport. The resorts of Madinat Coraya overlook Coraya Bay, an untouched Red Sea paradise renowned for astonishing emerald and turquoise waters. 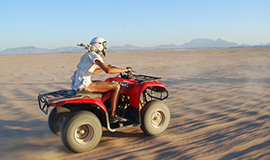 Visitors can enjoy an unhurried pace and tranquillity with first class service against majestic mountain views, a breathtaking sea environment and mystifying reefs set in the protected beauty of a nature reserve stretches from Madinat Coraya to Gebel Elba in the south. 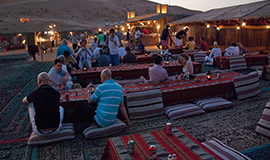 Madinat Coraya and Coraya Bay in particular are tipped to be the next diving "hot spot". 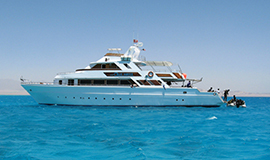 The whole coastline offers exceptional diving sites as well as an array of sporting activities on land and in the water for those who prefer a more active Egypt holiday experience. 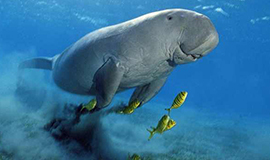 The most immediate attraction of the area is undoubtedly the underwater world of reefs and marine wildlife. 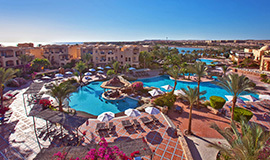 Madinat Coraya is one of Egypt's most peaceful destinations on the Red Sea coast. 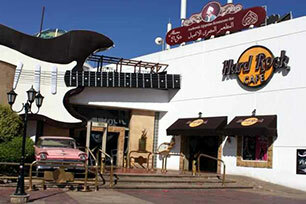 It’s a truly idyllic getaway and is the perfect base for a relaxing or exciting Egypt holiday. 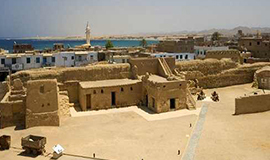 Aside from its growing reputation as one of the best diving resorts on the Red Sea, Madinat Coraya’s proximity to Luxor makes it an excellent base for trips to the various historical sites inland to the west along the Nile. 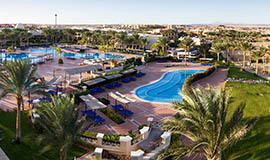 However you decide to spend your time, Madinat Coraya will deliver a truly memorable holiday under the Egyptian sun. 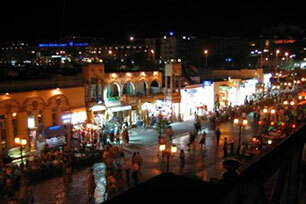 Madinat Coraya is a great base for sightseeing inland. 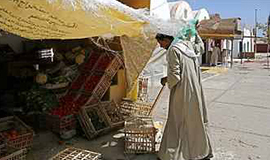 The little town of Al Quesir is an unspoilt piece of the real Egypt untouched as yet by excessive tourism and about a 45 minute bus ride from the resort. Luxor is within easy reach. 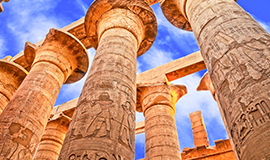 It’s often called the world’s greatest open air museum because the number of well preserved ancient monuments throughout the city and its surroundings,Luxor is close enough to make a day trip worthwhile. 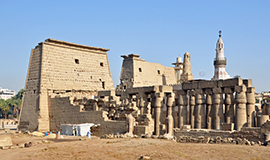 Built on the ruins of the ancient city of Thebes, the City of Luxor is on the east side of the Nile with Karnak just to the north and Thebes on the west bank. 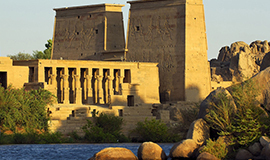 It’s a “must see” for any holiday in Egypt to view the Temple of Luxor built by Amenophis III and the Temple of Karnak. 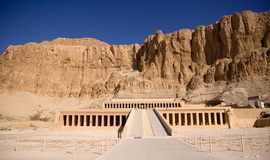 Luxor is also within easy reach of the Valley of the Kings and the Valley of the Queens. 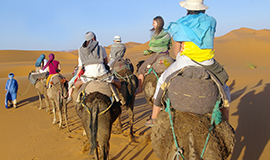 Madinat Coraya is also close enough for a trip to Mons Smaragdus (Emerald Mountains) of Cleopatra’s Emerald Mines located in the desert between Marsa Alam and the Nile Valley. Emeralds were prized by the ancient Egyptians as symbols of eternity and power and these mines were still productive up to the 14th century. 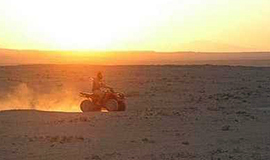 You can still see a number of ruins near around the Emerald Mines, Marsa Alam. The structures are well preserved and still have mine shafts as well as some temple remains. 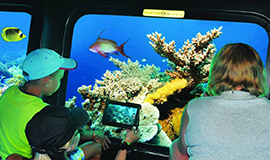 AquaCoraya recently open in March 09, located in Madinat Coraya, 67 km from Marsa Alam city, 5 km from Marsa alam international airport, offers wonderful, healthy fun for all age-groups, with slides up to 10 meters height. 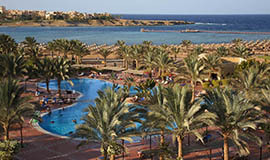 The only Aqua Park near to Marsa Alam in the coast line. 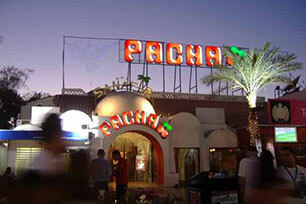 The water slides are flooding out of the walls taking you to the world of excitement and fun. These very high slides for individual sliding where a very high speed 10.5 meters height, in complete safety however, may be reached. The feeling of weightlessness is almost the same both for those who dare to try and those who prefer to stay on the ground and look. We offer this slides emotions and speed is guaranteed. Imagine a water slide where you lose yourself in space and time. You do not see anything and you are spinning constantly. Trust us when we say, you have not experienced anything like the BLACK HOLE, you will find yourself screaming to the end of this 40 meter long feeling of confusion and thrills. Rafting slide is perfect for the experienced riders and the excitement is almost the same for those who choose to watch from a distance. Enjoy and Share the fun with your whole family in this water game, sliding with your kids & splash down to the water in groups. Madinat Coraya hotels have their own private beaches exclusively available to hotel guests clustered around the calm and clear Coraya Bay. 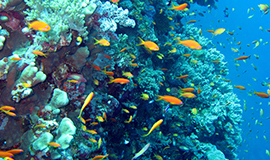 Beaches are sugary white sands pierced with straw sunshades fringing sapphire seas and spectacular coral reefs. 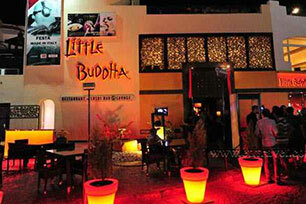 The place has an unhurried ambience that matches the soft rhythm of the waves on the beach. 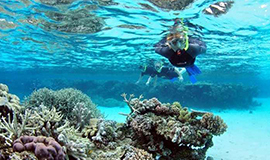 Other water sports are available on the doorstep but the main activity on and in the bay is scuba and snorkelling. Most hotels offer an array of pool-based watersports, including water polo. 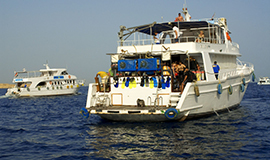 If it’s more organised and active water sports you’re after, then a trip to Aqua Coraya is a must. 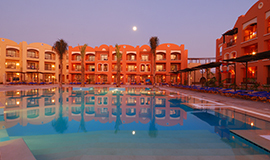 The only water park in the Marsa Alam area, it offers various fun and exciting activities for all ages, with water slides reaching up to a staggering 10 metres high. Aqua Coraya is a premiere attraction for the entire family, catering for very young ones with its children's slide pool and shorter slides landing in shallow waters. The Free Fall, Kamikaze and Turbo Slides are sure to provide an electrifying experience and for those who dare, there is the Black Hole with its 40 metre slide, the Rafting Slide with heart-pounding drops and dips, the Wide Slide and the Twister Slide with spiralling and twisting flumes. The park is fully staffed with certified lifeguards to ensure safe fun for everyone.